The Rugby World Cup is a rugby union tournament contested every four years between the top international teams. The tournament was first held in 1987, when the tournament was co-hosted by New Zealand and Australia. The most recent tournament was held in 2011 in New Zealand, whose national team won the tournament by defeating France in the final. The winners are awarded the William Webb Ellis Cup, named after William Webb Ellis, the Rugby School pupil who — according to a popular myth — invented rugby by picking up the ball during a football game. Three teams have won the trophy twice, Australia, New Zealand, and South Africa; while England have won the tournament once. The tournament is administered by World Rugby, the sport's international governing body. Sixteen teams were invited to participate in the inaugural tournament in 1987, however since 1999 twenty teams have taken part. England will host the 2015 World Cup, while Japan will host the event in 2019. The current format allows for twelve of the twenty available positions to be filled by automatic qualification, as the teams who finish third or better in the group (pool) stages of the previous tournament enter its successor (where they will be seeded). The qualification system for the remaining eight places is region-based, with Europe and the Americas allocated two qualifying places each, Africa, Asia and Oceania one place each, with the last place determined by a play-off. The previous format, used in 2003 and 2007, allowed for eight of the twenty available positions to be filled by automatic qualification, as the eight quarter finalists of the previous tournament enter its successor. The remaining twelve positions were filled by continental qualifying tournaments. Positions were filled by three teams from the Americas, one from Asia, one from Africa, three from Europe and two from Oceania. Another two places were allocated for repechage. The first repechage place was determined by a match between the runners-up from the Africa and Europe qualifying tournaments, with that winner then playing the Americas runner-up to determine the place. The second repechage position was determined between the runners-up from the Asia and Oceania qualifiers. The 2015 tournament will involve twenty nations competing over six weeks. There are two stages, a group and a knock-out. Nations are divided into four pools, A through to D, of five nations each. The teams are seeded before the start of the tournament, with the seedings taken from the World Rankings in December 2012. The four highest-ranked teams are drawn into pools A to D. The next four highest-ranked teams are then drawn into the pools at, followed by the next four. The remaining positions in each pool are filled by the qualifiers. The winner and runner-up of each pool enter the knock-out stage. The knock-out stage consists of quarter- and semi-finals, and then the final. The winner of each pool is placed against a runner-up of a different pool in a quarter-final. The winner of each quarter-final goes on to the semi-finals, and the respective winners proceed to the final. Losers of the semi-finals contest for third place, called the 'Bronze Final'. If a match in the knock-out stages ends in a draw, the winner is determined through extra time. If that fails, the match goes into sudden death and the next team to score any points is the winner. As a last resort, a kicking competition is used. 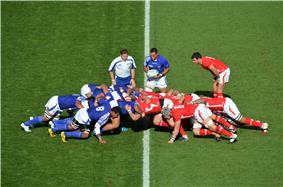 Prior to the Rugby World Cup, there were only regional international rugby union competitions. One of the largest and oldest is the Six Nations Championship, which started in 1883 as the "Home Nations" championship, a tournament between England, Ireland, Scotland and Wales. It became the Five Nations in 1910, when France joined the tournament. France did not participate from 1931 to 1939, during which period it reverted to a Home Nations championship. In 2000, Italy joined the competition, which became the Six Nations. In the southern hemisphere, the equivalent competition is The Rugby Championship, involving Argentina, Australia, New Zealand, and South Africa. It began in 1996 as the Tri Nations with the latter three countries participating; Argentina debuted in the renamed competition in 2012. Rugby union was also played at the Summer Olympics, first appearing at the 1900 Paris games and subsequently at London in 1908, Antwerp in 1920, and Paris again in 1924. France won the first gold medal, then Australasia, with the last two being won by the United States. However rugby union was soon removed from the Summer Olympic program. The idea of a Rugby World Cup had been suggested on numerous occasions going back to the 1950s, but met with opposition from most unions in the IRFB. The idea resurfaced several times in the early 1980s, with the Australian Rugby Union (ARU) and the New Zealand Rugby Union (NZRU) independently writing to the IRFB seeking to conduct a World Cup tournament. In 1985, Australia, New Zealand and France were in favour of a world cup and, despite knowing that the international sports boycott of the apartheid regime would prevent their participation, the South African delegates also voted in favour, which was vital in tying the vote 8–8. When one English delegate followed by a Welsh delegate switched sides, the IRFB finally approved the inaugural cup, by 10 votes to 6. The inaugural tournament, jointly hosted by Australia and New Zealand, was held in May and June 1987, with sixteen nations taking part. New Zealand became the first ever champions, defeating France 29–9 in the final. The subsequent 1991 tournament was hosted by England, with matches being played throughout Britain, Ireland and France. This tournament also saw the abolition of invitation qualification, with a qualifying tournament being introduced which involved thirty-five nations. Australia won the second tournament, defeating England 12–6 in the final. The 1995 tournament was hosted by South Africa and was the first in which South Africa participated, following the end of the international sports boycott. The tournament had a fairytale ending, as South Africa were crowned champions over New Zealand, with then President Nelson Mandela, wearing a Springbok jersey and matching baseball cap, presenting the trophy to South Africa's captain, Francois Pienaar. The tournament in 1999 was hosted by Wales with matches also being held throughout the rest of the United Kingdom, Ireland and France. The tournament included a repechage system, alongside specific regional qualifying places, and an increase from sixteen to twenty participating nations. Australia claimed their second title, defeating France in the final. Rugby World Cup Limited recommended to the IRB that the 2015 and 2019 World Cups be held in England and Japan, respectively, and in July 2009 it was announced that this proposal was adopted. The Webb Ellis Cup is the prize presented to winners of the Rugby World Cup, named after William Webb Ellis. The trophy is also referred to simply as the Rugby World Cup. The trophy was chosen in 1987 as an appropriate cup for use in the competition, and was created in 1906 by Garrard's Crown Jewellers. The words 'The International Rugby Football Board' and 'The Webb Ellis Cup' are engraved on the face of the cup. It stands thirty-eight centimetres high and is silver gilded in gold, and supported by two cast scroll handles, one with the head of a satyr, and the other a head of a nymph. In Australia the trophy is colloquially known as "Bill" — a reference to William Webb Ellis. The tournament has been hosted by multiple nations. For example the 1987 tournament was co-hosted by Australia and New Zealand. World Rugby requires that the hosts must have a venue with a capacity of at least 60,000 spectators for the final. Host nations sometimes construct or upgrade stadia in preparation for the World Cup, such as Millennium Stadium – purpose built for the 1999 tournament – and Eden Park, upgraded for 2011. The first country outside of the traditional rugby nations of SANZAR or the Six Nations to be awarded the hosting rights was Japan, who will host the 2019 tournament. Organizers of the 2015 tournament in England call the Rugby World Cup the third largest sporting event in the World, behind only the FIFA World Cup and the Olympics. Reports emanating from World Rugby and its business partners have frequently touted the tournament's media growth, with cumulative worldwide television audiences of 300 million for the inaugural 1987 tournament, 1.75 billion in 1991, 2.67 billion in 1995, 3 billion in 1999, 3.5 billion in 2003, and 4 billion in 2007. The 1999 RWC average attendance exceeded even the average attendance (42,269) of the following FIFA World Cup in 2002. The 2011 RWC in New Zealand saw the largest drop in attendance, averaging lower attendance than the 2011 Tri Nations competition (46,497). Twenty-five nations have participated at the Rugby World Cup (excluding qualifying tournaments). Of the seven tournaments that have been held, all but one have been won by a national team from the southern hemisphere. The southern hemisphere's dominance has been broken only in 2003, when England beat Australia in the final. Thus far the only nations to host and win a tournament are New Zealand (1987 and 2011) and South Africa (1995). The performance of other host nations includes England (1991 final hosts) and Australia (2003 hosts) finishing runners-up. France (2007 hosts) finished fourth, while Wales (1999 hosts) failed to reach the semi-finals. Of the twenty-five nations that have ever participated in at least one tournament, twelve of them have never missed a tournament. All Black Jonah Lomu holds a number of records: most career tries – 15 from the 1995 and 1999 tournaments, youngest player to appear in a final – aged 20 years and 43 days at the 1995 Final, and most tries in a single tournament – 8 in 1999. South African Bryan Habana equalled Lomu's record for most tries in one competition when he scored 8 in 2007. The record for most penalties in a match is 8, held by Matt Burke, Gonzalo Quesada, Gavin Hastings and Thierry Lacroix, and the record for most penalties in a tournament, 31, is held by Gonzalo Quesada. South Africa's Jannie de Beer kicked five drop-goals against England in 1999 – an individual record for a single World Cup match. A total of 16 players have been sent off (red carded) in the tournament. 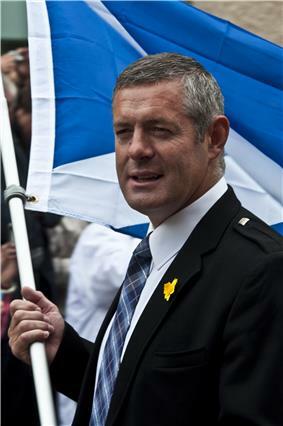 Welsh lock Huw Richards was the first, while playing against New Zealand in 1987. No players has been red carded more than once. Peatey, Lance (2011). In Pursuit of Bill: A Complete History of the Rugby World Cup. New Holland Publishers. ^ Peatey (2011) p. 59. 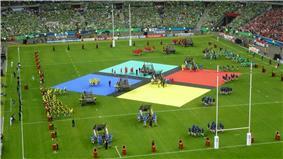 ^ "Caribbean kick off for RWC 2011 qualifying". irb.com. 3 April 2008. Retrieved 13 February 2012. ^ a b "Doin' it the Hard Way". Rugby News 38 (9). 2007. p. 26. ^ a b "Doin' it the Hard Way". Rugby News 38 (9). 2007. p. 27. ^ a b "Fixtures and Results". International Rugby Board. Retrieved 13 April 2014. ^ a b c d "Tournament Rules". rugbyworldcup.com. Archived from the original on 19 August 2007. Retrieved 29 September 2007. ^ "Rugby in the Olympics: History". International Rugby Board. Retrieved 13 April 2014. ^ Quinn, Keith (30 August 2011). "Keith Quinn: Back-history of RWC - part three". TVNZ. Retrieved 13 February 2013. ^ "Rugby World Cup 2015 Official Hospitality". RWC Ltd. Retrieved 2014-12-04. ^ "Potential Impact of the Rugby World Cup on a Host Nation". Deloitte & Touche. 2008. p. 5. Retrieved 12 April 2014. ^ Nippert, Matt (2010-05-02). "Filling the Cup - cost $500m and climbing". New Zealand Herald. APN New Zealand. Retrieved 2014-12-02. ^ Derriman, Phillip (2006-07-01). "Rivals must assess impact of Cup fever". Sydney Morning Herald (Fairfax). Retrieved 2006-07-01. ^ a b c International Rugby Board Year in Review 2012. International Rugby Board. p. 62. Retrieved 13 April 2014. ^ a b "Only the Strong Survive". Rugby News 38 (9). 2007. pp. 32–33. ^ Argentina, Australia, Canada, England, France, Ireland, Italy, Japan, New Zealand, Romania, Scotland and Wales are the nations that have never missed a tournament, playing in all seven thus far. South Africa has played in all five in the post-apartheid era. ^ a b c "All Time RWC Statistics". International Rugby Board. Retrieved 12 April 2014.